Growing up, I loved potatoes au gratin and scalloped potatoes. That was even the highly processed, “just add water and powdered cheese” varieties that came from a box. In the constant search to replace those starchy potatoes we all love, spaghetti squash has proven to be a worthy opponent. Plus, this recipe has bacon and we all know that bacon makes everything better. Now I can look forward to a low carb, gluten free version of a childhood favorite. Preheat oven to 400° Line a rimmed baking sheet with aluminum foil.Cut spaghetti squash in half lengthwise and scrape out the seeds. Drizzle olive oil over spaghetti squash, sprinkle with salt and pepper, and place cut side down on baking sheet. Bake 30 minutes. Remove from oven and allow to cool. Once the squash has cooled, use a fork to scrape the flesh into a large mixing bowl. To the bowl, add onions, bacon, sour cream, cheddar cheese, and Parmesan cheese. Mix until all ingredients are well incorporated. Transfer to a casserole dish. Reduce oven temperature to 350° Bake for an additional 20 minutes. This looks so good. I need to pin and make it later. Thanks. 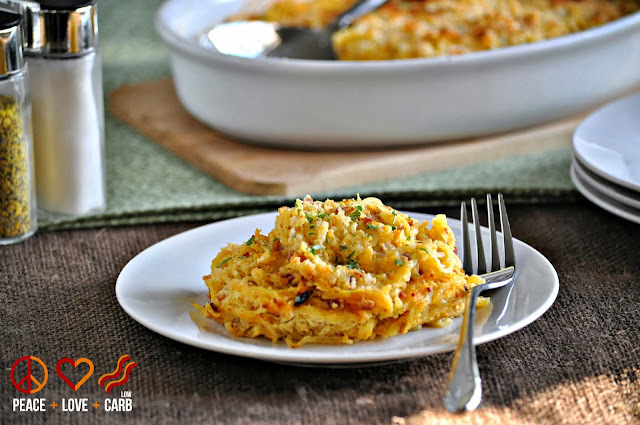 I was turned on to spaghetti squash a couple years ago and love to order it while we’re out, but I’ve never made it at home for fear of my family not liking it…..I’m pretty sure this recipe would win them over! BACON! I made this last night. My wife and I loved it. Very tasty. I had previously only used spaghetti squash that had been boiled and I didn’t really like it. Baking it gave it a nice nutty flavor and the dish was really good. Looking forward to having it again for lunch today at work. Rick, So happy to hear that you and your wife enjoyed it. I love this as leftovers also. I like to put and egg on it and have it for breakfast. This is in the oven now and I can already tell it’s going to be delicious. Thanks for the recipe! I recently got braces and can only eat mushy stuff… which is hard when you need to be low-carb as much as I do. I think this will be perfect, and it already smells amazing!! Follow-up! Yes, it’s delicious and I’d never know it was squash. I would think it was hash brown style potatoes. Thanks again Kyndra! Yay! A success. I’m thrilled that you liked it! No problem. I am so happy you are enjoying them! Delicious. Thank you. We had it today. Would Greek yogurt work in place of the sour cream? I don’t see why not. If you try it, let us know how it turns out. For some reason, I have been so intimidated by the idea of making spaghetti squash, but this recipe looks too good to pass up. I think I’m going to make it tonight for my picky “no veggie” hubby as a side dish for our chicken. I’ll let you know how it turns out! I just made this tonight, and it was absolutely delicious! I made this for the first time tonight and still get over how good it was!!! I am still amazed at how easy the squash was to bake and break down. What a versatile vegetable! I want to try it so many different ways now that I have the confidence to make it. It’s a great substitute for potatoes or pasta and tastes amazing. Thanks for the great idea. Even my picky eater enjoyed it and my husband had seconds and said I could make it again. Now that’s a great review. Keep ideas like these coming, I love it!! 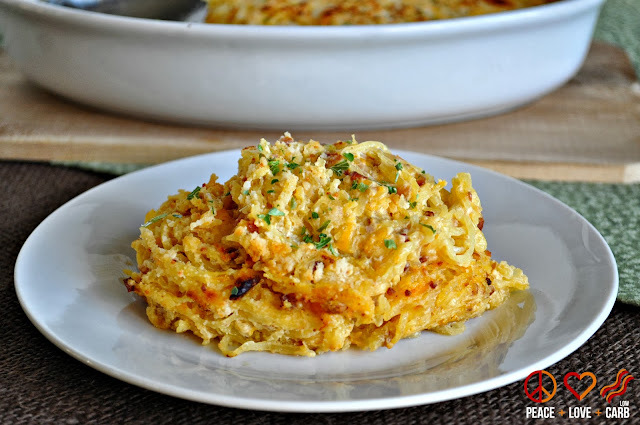 I just found this recipe while searching for ways to use my spaghetti squash. I made it and it turned out delicious! It was a great substitution for potatoes to go along with my steak dinner. Thanks! Yay! So happy you enjoyed it. I tried this with leftover ham and it was amazing. Yum! I have ham in the fridge right now. I will have to give that a try. I love spaghetti squash! I just recently found out that if you cut it across the fat middle instead of lengthwise though the spaghetti “strands” you get will be longer. The strands actually spiral around the inside instead of up and down the length of the squash. So cool! Been trying all sorts of new recipes lately and made this for dinner today. WOW is all I have to say. It is fantastically good. This dish will definitely make it into a regular rotation for dinner. I was a bit skeptical at first but am amazed at how good this dish is. Only thing I had issues with was getting it to brown. I cooked it for 30 minutes @ 350 for the second part and it had barely started browning on the edges. I will probably just bump to 375 next time. I made this today and it is delicious!!! I used slightly less sour cream because I had a smaller squash. I also added a small sprinkle of nutmeg and topped it with a little extra cheese. So good!!!! Comfort food for sure!!! Thanks for the recipe! I love this dish SO MUCH. 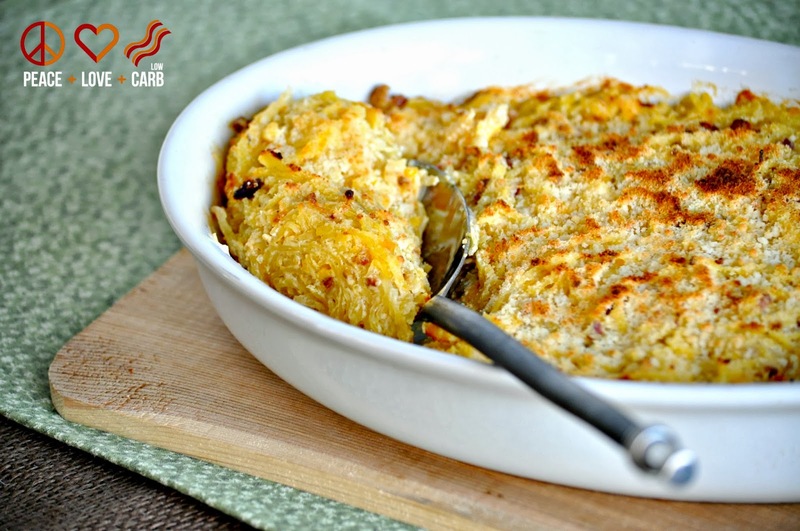 This is the go-to dish for me when I need to remind myself how decadent low-carb eating can be. This rivals the best mac & cheese I’ve ever eaten as a comfort food. This looks so good! It is hard to find a healthy hearty dinner idea!